I am heading back home to Ontario tomorrow so the cupboards here are getting a wee bit bare. I looked around at what I had and came up with this quick and easy dish. I love this picture because you can see the steam rising off of it--that's fresh food, baby! 1. Do what you have to do to cook your noodles. 2. Meanwhile, prep tofu. You can toss it in flour or cornstarch and fry in oil (like I did), or just cube it. Or cube it and fry in a lightly oiled pan until golden. Your call. 3. Heat coconut milk over medium heat in a saucepan. When bubbling, whisk in curry powder, salt and sugar. Add veggies and return to bubbling. If you are using plain tofu cubes, add them in now. Let simmer while noodles finish. 4. Rinse noodles under cold water and drain well. Place 1 cup of noodles in four bowls and top with sauce. 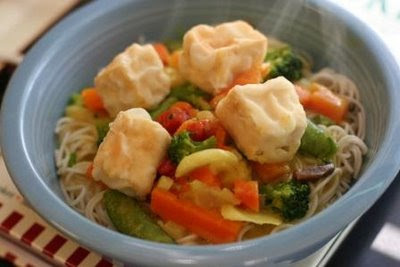 Top with tofu cubes and enjoy!